"The Best Fishing in Idaho"
Mountain River Outfitters in Riggins Idaho offers the best in guided Idaho fishing for Steelhead, Chinook Salmon, Bass, Trout and Sturgeon. Drift Boat, Jet Boat or Raft we have trips for the most avid sportsman to the beginner, 1 to 6 day trips along with our "Cast and Blast" Chukar hunting and fishing combo. The guides at MRO are professional licensed fishing guides committed to providing each and every guest with personalized attention and instruction for either conventional tackle or fly fishing. Our guides will convey the history of these great wilderness rivers show you where to catch more fish. 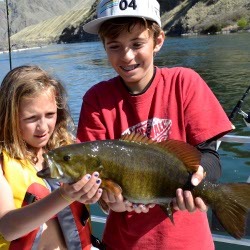 The Snake and Salmon Rivers offer great summer Small Mouth Bass Fishing Jet Boat Fishing "Hells Canyon" or Salmon River Drift Boat trips. Fish for Sturgeon, Bass and Trout while Experiencing the Snake River's Hells Canyon Wildernes on our Jet Boats, catching one of these monsters is awesome. Spring Chinook Fishing on the Salmon River or Fall King Salmon Fishing on the Snake River, choose drift boat or jet boat. World-class 4 Day Bass fishing adventures in Hells Canyon on the Snake River or 2 or 3 Day Trout fishing in the River of No Return Wilderness. Chukar Hunting and fishing Combo in Hells Canyon or on the Salmon River. Hunt Chukar from the boat while fishing for Salmon, Steelhead, Bass or Sturgeon. Enjoy great fishing inthe serenity and beauty of the Salmon River Canyon. The drift boats are perfect for our guides to instruct and help you learn how to catch your fish of choice. The only sounds you will hear will be of nature and the splash of the oars as your guide navigates the river. World Class fishing charters no matter what time of year. Choose from winter Steelhead fishing, Spring and Fall Chinnook Salmon, Sturgeon, Bass and Trout. Many seasons coincide for multiple species most of the year. You will love fishing from and admiring these great canyons that surround our rivers in our Jet Boats. Your captain and guide will give you the best chance at fish along with a fun loving attitude and knowledge of the area. 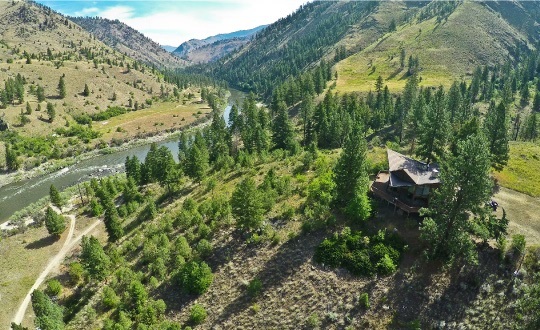 Idaho's premier wilderness fishing lodge, located on the main Salmon River in the "River of No Return Wilderness"
Steelhead fishing in the Frank Church Wilderness along with lodging, experience the Ram House Lodge at Mackay Bar at the confluence of the South Fork of the Salmon River. Looking to catch Steelhead on your fly rod we have 2 and 3 day packages in October, November and Mid Febuary thru March. You hit a home run with your guides! All the guys really enjoyed them all!!!! Connie and Travis were awesome as well and great food!! Jeff was a blast on the jet boat!! Enough said. All my group just had high praise for your company, personnel, equipment and there knowledge of fishing, hunting, and the river. Job well done! Everyone would definitely return to do it all again! It was epic!! !